Stuart Mellan and his wife, Nancy, have five kids, all of whom are in their 30s. The two originally met in Allentown, Pennsylvania, and started dating after both becoming widowed. Stuart had two kids, Nancy three. The two eventually married, blending the family. 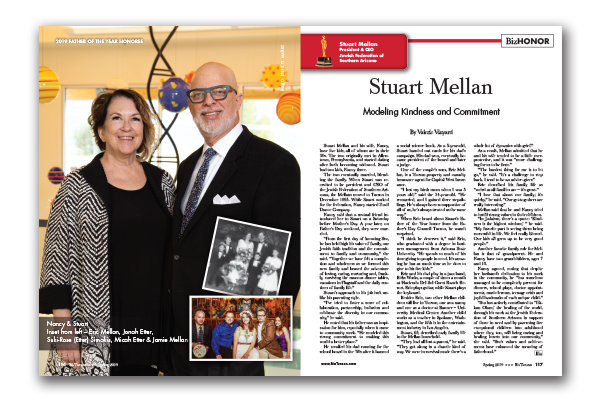 When Stuart was recruited to be president and CEO of the Jewish Federation of Southern Arizona, the Mellans moved to Tucson in December 1995. While Stuart worked for the federation, Nancy started Zuzi! Dance Company. Nancy said that a mutual friend introduced her to Stuart on a Saturday before Mother’s Day. A year later, on Father’s Day weekend, they were married. Stuart’s approach to his job isn’t unlike his parenting style. “I’ve tried to foster a sense of collaboration, partnership, inclusion and celebrate the diversity in our community,” he said. He recalled his dad running for the school board in the ’50s after it banned a social science book. As a 5-year-old, Stuart handed out cards for his dad’s campaign. His dad won, eventually became president of the board and later a judge. One of the couple’s sons, Eric Mellan, is a Tucson property and casualty insurance agent for Capital West Insurance. When Eric heard about Stuart’s Father of the Year honor from the Father’s Day Council Tucson, he wasn’t surprised. Eric and his dad play in a jazz band, Birks Works, a couple of times a month at Hacienda Del Sol Guest Ranch Resort. Eric plays guitar, while Stuart plays the keyboard. Besides Eric, two other Mellan children still live in Tucson, one as a nanny and one as a doctor at Banner – University Medical Center. Another child works as a teacher in Spokane, Washington, and the fifth is in the entertainment industry in Los Angeles. Stuart, 65, described early family life in the Mellan household. Mellan said that he and Nancy tried to instill strong values in their children. Another favorite family role for Mellan is that of grandparent. He and Nancy have two grandchildren, ages 7 and 10.